The Vibrionaceae are a family of Proteobacteria given their own order. 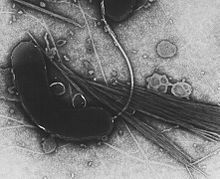 Inhabitants of fresh or salt water, several species are pathogenic, including the type species Vibrio cholerae, which is the agent responsible for cholera. Most bioluminescent bacteria belong to this family, and are typically found as symbionts of deep-sea animals. Francisella is a genus of pathogenic, Gram-negative bacteria. 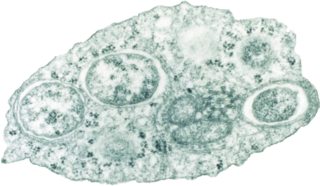 They are small coccobacillary or rod-shaped, nonmotile organisms, which are also facultative intracellular parasites of macrophages. Strict aerobes, Francisella colonies bear a morphological resemblance to those of the genus Brucella. The Pseudoalteromonadaceae are a small family of Proteobacteria. 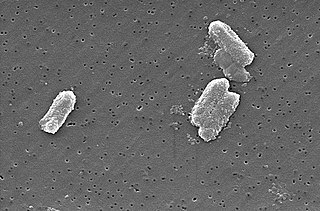 Alteromonas is a genus of Proteobacteria found in sea water, either in the open ocean or in the coast. It is Gram-negative. Its cells are curved rods with a single polar flagellum. Idiomarinaceae is a Gram-negative and mesophilic family in the order of Alteromonadales. Bacteria of the family Idiomarinaceae occur in saline environments. Alkalimarinus is a Gram-negative genus of bacteria from the class of Alteromonadaceae with one known species. Alkalimarinus sediminis has been isolated from sediments from the coast of Weihai in China. 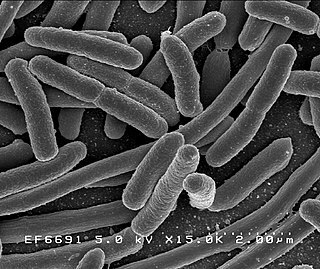 Alkalimonas is a genus in the phylum Proteobacteria (Bacteria). Arenicella is a genus of bacteria from the class of Alteromonadaceae. The Methylococcaceae are a family of bacteria that obtain their carbon and energy from methane, called methanotrophs. Methanotrophs are prokaryotes that metabolize methane as their only source of carbon and energy. They can be either bacteria or archaea and can grow aerobically or anaerobically, and require single-carbon compounds to survive. Acidithiobacillus is a genus of the Acidithiobacillia in the "Proteobacteria". Like all "Proteobacteria", Acidithiobacillus spp. are Gram-negative. Some members of this genus were classified as Thiobacillus spp., before they were reclassified in 2000. The Chromatiaceae are the main family of purple sulfur bacteria. Many members conduct an anoxygenic photosynthesis. They are distinguished from the Ectothiorhodospiraceae by producing sulfur globules and storing them inside their cells. 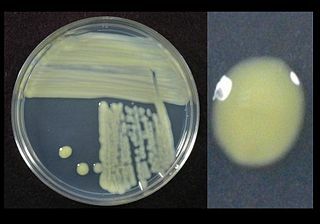 Most species of Ectothiorhodospiraceae are also purple sulfur bacteria but they store the globules outside their cells. The sulfur is an intermediate in the oxidization of sulfide, which is ultimately converted into sulfate, and may serve as a reserve. Pseudomonas syringae is a rod-shaped, Gram-negative bacterium with polar flagella. As a plant pathogen, it can infect a wide range of species, and exists as over 50 different pathovars, all of which are available to researchers from international culture collections such as the NCPPB, ICMP, and others. Whether these pathovars represent a single species is unclear. Pseudomonas savastanoi is a Gram-negative plant pathogenic bacterium that infects a variety of plants. It was once considered a pathovar of Pseudomonas syringae, but following DNA-relatedness studies, it was instated as a new species. It is named after Savastano, a worker who proved between 1887 and 1898 that olive knot are caused by bacteria. Xanthomonas is a genus of Proteobacteria, many of which cause plant diseases. Halo blight of bean is a bacterial disease caused by Pseudomonas syringae pv. phaseolicola. Halo blight’s pathogen is a gram-negative, aerobic, polar-flagellated and non-spore forming bacteria. This bacterial disease was first discovered in the early 1920s, and rapidly became the major disease of beans throughout the world. The disease favors the places where temperatures are moderate and plentiful inoculum is available. The bacterial phyla are the major lineages, known as phyla or divisions, of the domain Bacteria. ↑ Holt JR (6 February 2013). 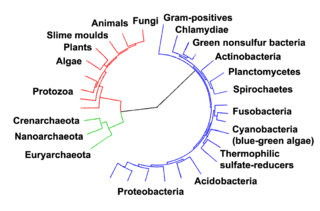 "Description of the Phylum Gammaproteobacteria". Susquehanna University - Systematic Biology Course Website. Retrieved 17 April 2018. ↑ Williams, K. P.; Gillespie, J. J.; Sobral, B. W. S.; Nordberg, E. K.; Snyder, E. E.; Shallom, J. M.; Dickerman, A. W. (2010). "Phylogeny of Gammaproteobacteria". Journal of Bacteriology. 192 (9): 2305–2314. doi:10.1128/JB.01480-09. PMC 2863478 . PMID 20207755. ↑ "Classification of domains and phyla - Hierarchical classification of prokaryotes (bacteria) - Gammaproteobacteria". List of Prokaryotic Names with Standing in Nomenclature. Retrieved 13 January 2017. Medical Subject Headings (MeSH) is a comprehensive controlled vocabulary for the purpose of indexing journal articles and books in the life sciences; it serves as a thesaurus that facilitates searching. Created and updated by the United States National Library of Medicine (NLM), it is used by the MEDLINE/PubMed article database and by NLM's catalog of book holdings. MeSH is also used by ClinicalTrials.gov registry to classify which diseases are studied by trials registered in ClinicalTrials.